There were occasions during my flying career where snow and aviation collided. Ages ago, when I eked out a living as a flight instructor, I was able to earn more money clearing the runways with the owner’s decrepit, underpowered, pickup truck rigged with an oversized plow blade and minimal heat, than the way-below-poverty-level income guaranteed to me for actually teaching. Once, to save money, the owner decided to dig out his airport himself and it turned into an unpaid, compulsory, two week “vacation” for me. 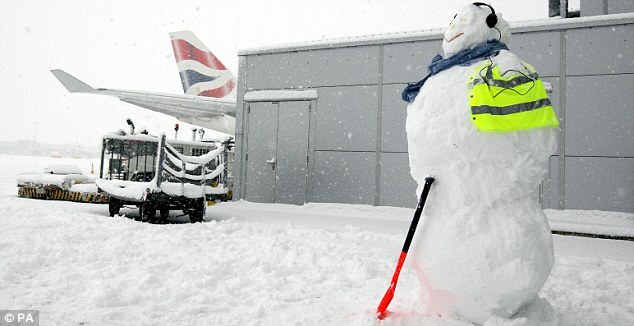 That’s how long it took him to get the airport unburied without assistance. I think it was his way of cutting costs, but it seems to me that it would have been better to have at least a minimal revenue stream during those two weeks. After all, even though he didn’t have to pay any of his staff, he still had utilities and other fixed expenses. Either way, I was stuck at home eating Ramen Noodles. Some vacation. I didn’t even get a lousy t-shirt. Things changed significantly when I worked as a freight dog, though. I actually did have one snow day during my 5 years of employment. I was flying a route out of Midway airport that started around 4:00 p.m. and ended at midnight. I arrived on time, despite the fact that the airport was closed and no one was going anywhere, to find the first of our 3 Beech Barons in the hangar awaiting some TLC from maintenance. The second was also parked in the hangar, which, as it turned out, could not be opened because the door had been sealed shut by drifting snow. The third aircraft was almost completely buried outside on the ramp, with only a single propeller blade protruding from its frozen shroud. Dispatch insisted that I wait to see if the airport would open. I believe their plan was for me and my colleagues to simultaneously fly the single usable – but trapped – Baron to complete our routes. Instead, we passed the time engaged in a snowball warfare on the ramp. After about six hours of goofing off, not including my numerous calls to Dispatch begging them to give up the ghost and let me go home, coffee breaks, and time spent checking the weather radar, they finally relented and let me – and only me – go home an hour before my shift would have ended anyway. It took three guys to push my car, snugly encased in six hours of relentless snowfall, out of its parking spot and into the deserted street, but it was worth it. That hour of snow-related freedom was immensely better than the two weeks I suffered through as a flight instructor. Mostly because there was no Ramen involved.